Yoga for runners is great for several things including flexibility, balance, relaxation (don't be mislead by this word - it is still a workout! ), strengthening your core, stretching and so much more. Not to mention that yoga for runners will lesson your chance of injury and is a great way to recover if you feel an injury coming on. And it's a great thing to do on your off-days from running as it is easy on the joints. I have also found that it helps with my breathing while running, since Yoga for runners teaches you to relax and breathe deep; this can be very helpful for your running. If you're looking to try yoga, there are several ways you can get started. You can hire a personal instructor, get a DVD, take a yoga classes at your gym, or go to a yoga studio. You can even get free yoga lessons on line. I'm particularly fond of this website because it gives very clear instructions and illustrates the poses with pictures. Yoga is also a great fitness routine for pregnant women, especially in the third trimester. Many yoga studios even have specific classes for pregnant women which are a great way to stay fit during your pregnancy and prepare for the birth. After the birth they even have mommy and me yoga classes where you can bring your new bundle of joy with you. I'm particularly attracted to the balance part of yoga. Having grown up as the ultimate klutz, which is surprising since my name means graceful...the irony, I am always looking for ways to find that perfect balance. When I've gone to yoga classes with various friends who I was sure were in much worse shape than me, after all, they couldn't run a marathon like me, I was shocked to see them do the downward dog no problem, while I was so bad at it, the instructor just gave me a sympathetic smile. But yoga for runners is about more than physical balance. 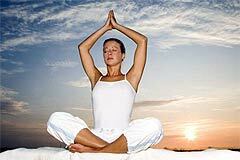 Yoga may teach you to stand on one foot in addition it will also teach you spiritual balance, and mental balance. Hey, I may still be working on the physical part of it, but yoga has helped me with meditation, clearing my mind and getting centered and focused.